April 2019 - it is not too soon!! Three strands of blue oval stones separated by white metal links suspended from a stylized fleur-de-lis silver element attached to an expandable (16.5 – 20”) silver link chain with a lobster claw closure. Handmade Goddess Doll handcrafted by the donor using a French themed cotton material with black fashion feathers attached along with a blossom button. The doll stands approx. 8” tall X 5” at widest point. Weighted at the bottom for ease in standing. ​Handcrafted by our donors, here we have a variety of natural stone interspersed with Hematite beads creating a 7” bracelet with a lobster claw closure. Hematite helps to absorb negative energy and calms in times of stress or worry. Glass enclosed Triquetra symbol in the center of an Astrological and Wheel of the Year Sabbats image in black and white, along with a 19” white metal link chain. The reverse side of the pendant has an intricate kaleidoscope design. You Can Read Palms by Richard Webster. 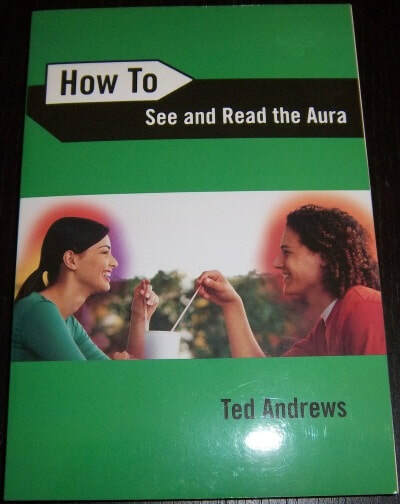 From the back cover: “In this illustrated guidebook the author presents the essentials of palm reading with fun and easy to learn techniques. He offers “quick read” tips that give a beginning palmist the confidence and ability to do readings almost immediately”. This is a hand knitted hood made by Anastasia in dark brown with the outer edges and accented in a beige blend. The hood has 2 long extensions to secure and wrap around your neck. This would surely keep you warm from the fall and winter winds for those who live in cold winter climates. The picture does not do the hood justice. This book donated and written by the First Priestess of the Correllian Tradition will be signed / inscribed to the winning bidder’s request. From the back cover: “The book details the extensive knowledge from the author, gathered from her many years training in the Sea Priestess tradition. Every page contains an opportunity for transformation by teaching you how to untangle from your attachments and embrace the joy of cosmic water wisdom. Can’t wait for the auction to end – check out the CorrStore: Book is new ($20.95) retail. Here we have a very organic pendant, combing stone and metal created by our donor. This piece combines leopard jasper, silver tone and red trade beads with thin metal washers and an elongated heart. All the pieces of this work of art are suspended from an approx. 25” leather cord. The suspended “pendant” measures 5” from the cord. This is surely a one of a kind! – New on card, removed to take the picture. Here we have “Glitz and Feathers”. The bracelet is a mesh tube filled with small aqua glass or plastic crystals that yield a light sparkle when exposed to light. The magnetic closure (white) is surrounded with clear crystals that complement the sparkle effect. In addition lightweight aqua feather earrings with tiny metal bead design (for pierced ears) complete this ensemble. The bracelet measures approx. 8 ½” and the feathers are approx. 3” long. This set comes to you in a decorative mesh bag. This is a white metal (silver?) reticulated design with Abalone insets suspended from a decorative finding, just add your favorite silver chain or cord. The pendant measures approx. 1 ½” wide X 2 1/8”long to the top of the cord / chain finding. Psychic Protection for Beginners – Creating a Safe Haven for Home and Family by Richard Webster. From the back cover – Our homes are places of refuge, where we can rest easy and feel secure. But even in our most personal space, we need protection against the negativity, stress, and other unwelcome energies that we face every day. To make your home and loved ones as safe as possible, psychic protection is essential – and you can learn how to do it in a matter of minutes. 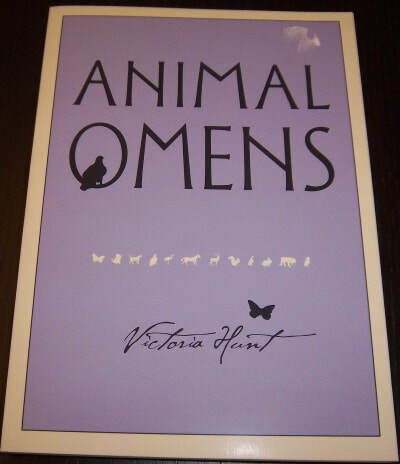 This softcover book ($15.95) is in like new condition. Insight Story Cards in a Pouch is the “cards-only” version of the card and book set. It has all of the 90 symbolic images, which can be used for storytelling, personal insight and community building, but does not include the 268 page guidebook. The Insight Story Guidebook not included is available for purchase at http://theinsightstory.com/buy-now/ is a 268 page guide to the cards that gives a 1-2 page summary of each card and what it may mean for you. This 90 card deck in a velour pouch is in excellent used condition. 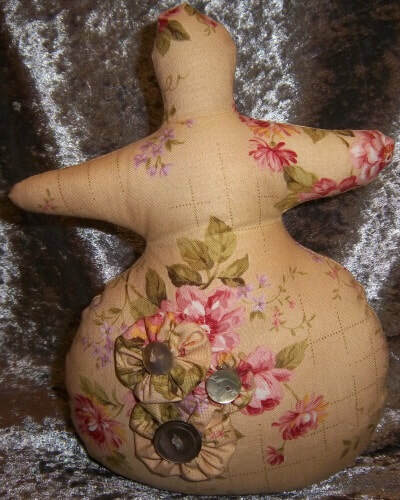 Handmade Goddess Doll, the second in this years auction, handcrafted by the donor using a floral themed cotton material with 3 blossom buttons. The doll stands approx. 8” tall X 5” at widest point. Weighted at the bottom for ease in standing. Wicca in the Kitchen by Scott Cunningham. From the rear cover: Virtually any item in your pantry can be used for personal transformation. From artichokes to kidney beans to grape jelly. Food contains specific magical energies you can harness for positive results. This encyclopedia of food magic offers 27 of Scott’s favorite recipes. This is a softcover book ($17.95) in used condition. Here we have a stainless steel choker with a oval link chain adding a goth touch to this lightly used piece. The choker is approx. 7/8” at the center and gradually reduces to 5/32” at both ends. Donated By: Rev. Kai Aiden H.P. This Tree of Life designed pendant has colorful clusters of natural stones with an owl charm suspended from the curving tree trunk, The pendant comes with a 22” silver cord chain with lobster claw closure. This piece is new and comes in an aqua mesh bag. 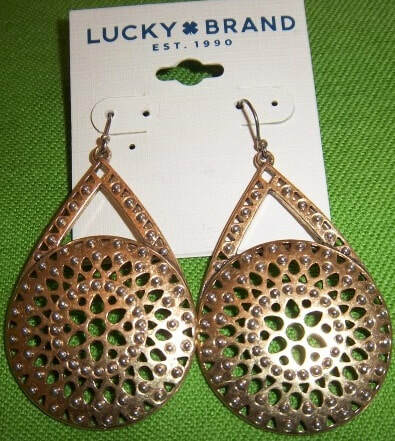 Continuing with jewelry maker’s donations, we have an earrings and pendant set. 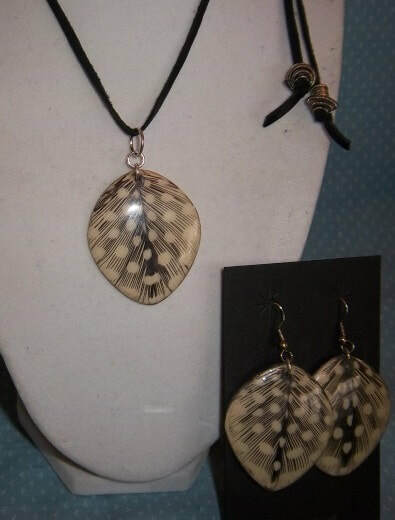 The feather design is on bone to form a 3 piece matching set. The pierced earrings are approx. 1 ¾” X 1 ½” as is the pendant. The pendant has a 34” leather cord with silver tone accents and the cord is adjustable with a lapis ring to adjust the length. This set is new on card and bagged, removed only to take the picture. Just in time for Fall and Winter! 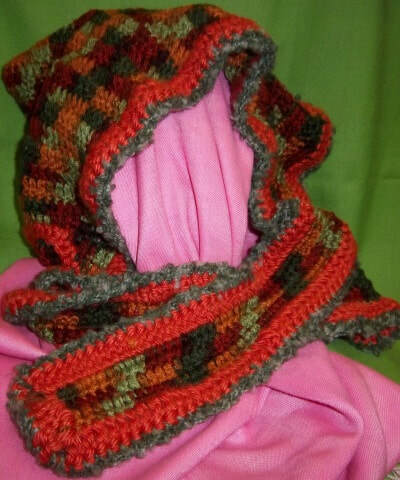 This is a hand knitted hood made by Anastasia in multi-color Fall foliage. The hood has multiple spirals in burnt orange and has a pair of approx. 16” extensions to tie or wrap around the neck. This would surely keep you warm from the cold and winds. The picture does not do the hood justice. Yule – A Celebration of Light and Warmth by Dorothy Morrison. From the rear cover: In the pages of Yule, the author presents a wonderful potpourri of holiday lore from around the world and throughout history, along with fun crafts, delicious recipes – even a calendar of celebrations for every day in December. Just in time for the upcoming holiday season. This is an over-sized softcover book ($14.95) in gently used condition. This is an Altar Cloth, or can be used as a Wall Hanging for your ritual space. I would describe as a stylized Eastern design, emphasizing the virtues of the sun as well as Ying / Yang balance. The cloth is 100% cotton measuring approx. 59” X 85”. Lightly Used. edit. Here we have a fun piece of jewelry in multi-color beads, faceted black and silver spacers, along with a series of small magnets the entire length. The magnets act as the closure to wear in a wide range of lengths around the neck, or coiled around your wrist. The overall length is approx. 34” that would go around the wrist several times. 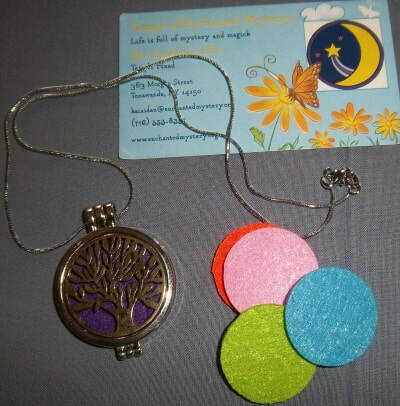 This is a nice hinged locket with a reticulated tree design on both sides allowing you to add a variety of colored felt disks that can be moistened with your favorite essential oils. Included with the locket / pendant are 5 disks and an 18” silver cord style chain. ​They Young Oxford Book of Folk Tales by Kevin Crossley-Holland. From the back cover: This is a collection of folk tales from all over the world. You’ll meet ghosts, princesses, dragons, sharks, ghouls, ogres, emperors, robbers, and invisible dogs. As we move from place to place, historical time to no time, we become aware that all stories combine to be one story – our story. This is an Ex-Library hard back book in excellent condition, except normal library marks / stickers. A practical Guide To The Runes by Lisa Peschel – Their Use in Divination and Magick. From the back cover: This guidebook will help you discover the oracular nature of the runes and how to use them as a magickal tool for insight, protection, and luck. This is a pocket size book ($6.99) in like new condition. Here we have another offering from our jewelry makers in Florida. This is an anklet constructed of Shell, Magnasite / Howlite with wood and antiques bronze beads and lobster claw closure. Magnesite/ Howlite has potent metaphysical properties and its calming vibration aids creative visualization, imagination and clear psychic visions. It opens and prepares the mind to receive the energies and wisdom of attunements. Shell stimulates intuition, sensitivity, imagination and adaptability. This anklet is new and measures approx. 10” in length. Titled “Sweetheart” by the jewelry maker this pair of earrings is made of silvertone metal with a deep green marble like bead from which the reticulated hearts are suspended. For pierced ears and measure approx. 1 ½” below the finding. New on card. Here we have one of Stephanie’s early pendulum pieces from her collection. It has a white glass bead to hold and then a series 7 multi-colored chakra beads interspersed with the brass chain links, ending with a nice crystal point. The overall length is 10” in used / aged condition. 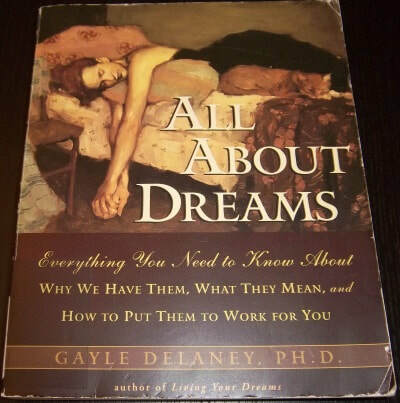 All About Dreams by Gayle Delaney, PH.D. From the front cover: Everything you need to know about – Why we have them, What they Mean, and How to put them to work for you. From the back cover: Dipping into the ancient well of dream history, internationally renowned dream work pioneer, the author whisks us along on a brief and fascinating tour of the roots of our thinking about dreams… This is an oversized softcover ex-library book ($15.95) in used condition. The Street Smart Physics Guide To Getting A Good Reading by Lisa Barretta. From the back cover: Sassy, candid, and spot-on, the author’s guidance will help you choose the psychic that’s right for you – astrologer, medium, tarot reader, or phone-line psychic – and steer clear of charlatans. Trues stories from her career as a psychic reader reveal what to do – and what not to do – to build rapport with your psychic and get the best possible reading. This is a softcover book ($16.95) in like new condition. Here we have a full set of Owl themed jewelry. Included is a necklace, bracelet, ring and pierced earrings. The owl pendant measures approx. 1 3 /4 “on a 20” silver metal chain. The bracelet is 6” long, the ring is expandable and completing this ensemble is a pair of earrings. Each piece has rhinestones for the eyes as well as aqua colored accents. Wear the wisdom of the Owl. Dream Beads, the concept created by Lady Stephanie helps one to re-examine one's daily dreams as one meditates. Hand beaded by the donor using purple disc / oblong glass beads spaced with deep orange amber beads Approx. 10” long. Instructions on their use will be included. From our jewelry makers in Jacksonville Florida we have a second anklet composed of various colored natural stone along with iridescent metal stars as accents. This piece measures approx. 10” with antiqued brass lobster claw closure. This T-Shirt in Correllian Blue has the Tradition’s embroidered Correllium on the chest area. 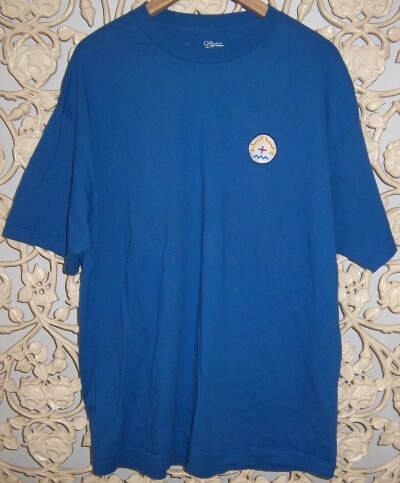 The size is XL and the donor stated it has been washed, but never worn. Our last item from this jewelry maker is a pair of earrings titled “tomb”. They are for pierced ears topped by a white metal pyramid of spirals and a loop of black glass beads suspended from the pyramid along with a cross charm in the center. They measure approx. 2“ from the silver ball below the pierced ear finding. New on card. Here we have a second pendulum culled from Lady Stephanie’s extensive collection. This orange and white shaped stone is at the end of a 6 1/2”metal chain and topped by an orange bead. Overall length is 8 1/4”. Gods and Myths of the Romans – The Archaeology and Mythology of Ancient Peoples by Mary Barrett. This is an over-sized “coffee table type” hardback book with the writings of the author and loaded with photographs / illustrations by Michael Dixon. Overall this large heavy book is in great used condition, except some edge wear and some tears to the rear of the dust jacket.